Business cards are no longer just a way to creatively and memorably share our contact information. They’re also another data point that can be scanned, shared, analyzed, and retained in various ways. I love Evernote, and organize a large part of my life with it. It also performs optical character recognition (OCR) on items like business cards, so you can categorize and search for information. Reverse/white-on-black or colored backgrounds were particularly difficult for Evernote to recognize. It could not read one card no matter what I did. Items that run into each other, such as names and job titles, were difficult for both tools (Evernote and LinkedIn) to recognize. Creative typography such as vertical and circular type failed miserably. Elaborate designs confuse Evernote. 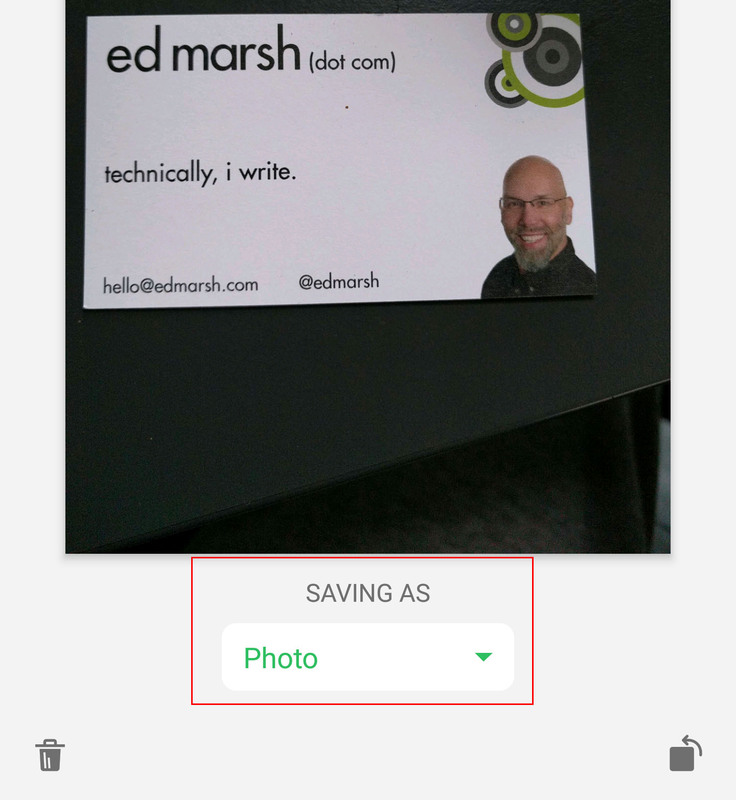 If it has a problem, it designates the card as a photo instead of a business card. This added an extra step to the process, as I had to manually tell Evernote via a drop-down that it was business card, not a photo, and wait for it to recognize the content, which it often could not. If your information isn’t structured correctly, then Evernote doesn’t recognize it as a business card. 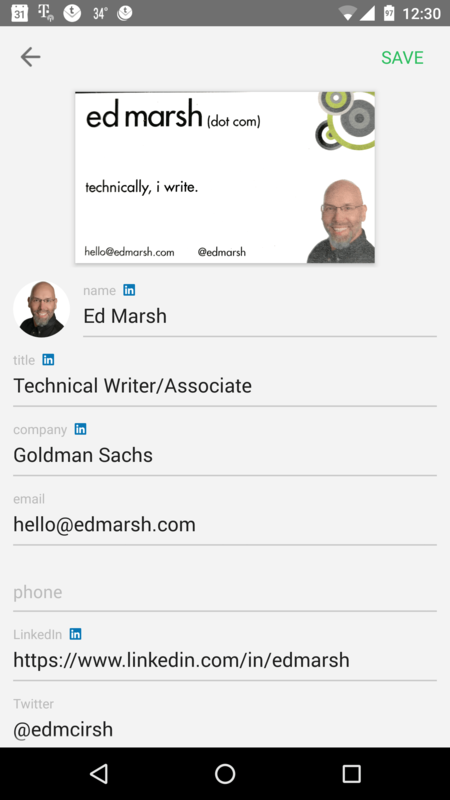 As a test, I scanned my own business card in, to see how it would perform and how LinkedIn would pick it up. I was surprised to see that it recognized my email address, but incorrectly recognized my Twitter handle. 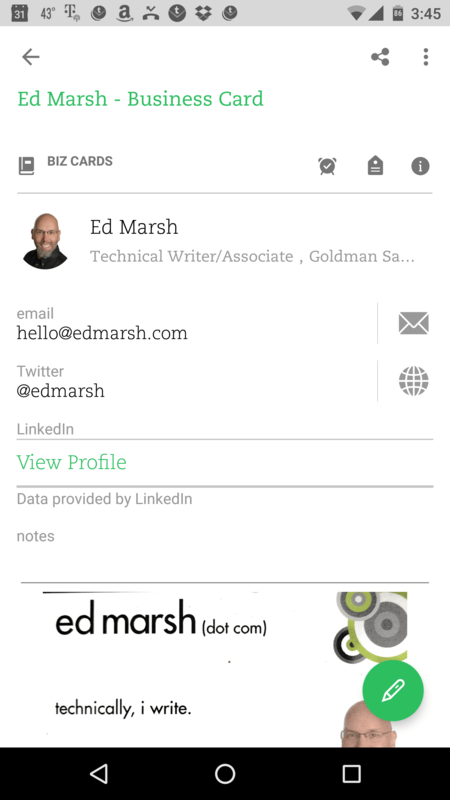 It’s also interesting to see that LinkedIn’s job title overrode my own card, but not my email address. Your business card is disposable, but its information is not. When creating your business card, it’s important to consider both design and structure. Make sure your content types (title, company, social media) are separate and easy for OCR software to recognize. Ensure your design doesn’t obscure the information you want recipients to retain — and scan. Consider labeling information for quicker information processing. Ensure fonts are legible and easy to scan. Here’s to a happy, well-organized 2017!